Welcome to the charter yacht “SAMARIC” — Monte Fino 78 berthed in Club de Mar in Palma de Majorca. This exclusive motor yacht was built in 2008 and received an extensive refit in 2017. It has a total length of 23.70 meters and offers space for up to eight overnight guests in four double cabins with four luxurious bathrooms. For a day charter, up to twelve guests can stay aboard the yacht. The captain, a stewardess and a cook take care of the wishes of the charter guests. The “SAMARIC” is a very nice and big boat. It has elegant lines and has a very good performance. Two Caterpillar engines with a combined output of 3,100 hp provide a cruising speed of 12 knots and a maximum speed of 25 knots. 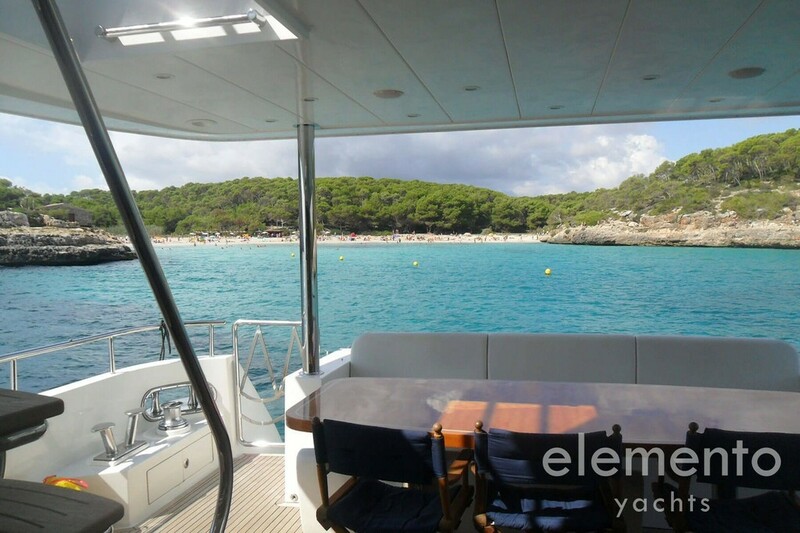 These values ​​are perfect to spend beautiful holidays in the Mediterranean Sea between Majorca, Ibiza and Menorca. With this yacht you can travel relaxed and fast at the same time. On deck the “SAMARIC” — Monte Fino 78 convinces with modern design and luxury. 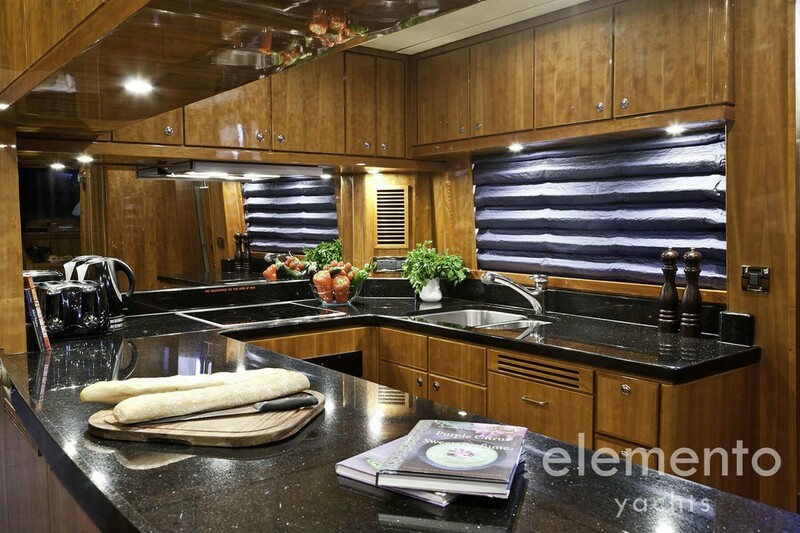 The motor yacht offers at the stern as highlight a large bathing platform and on the flybridge a BBQ. The bimini over it can be opened. Above the aft deck is a bimini hardtop. Both donate plenty of shade. 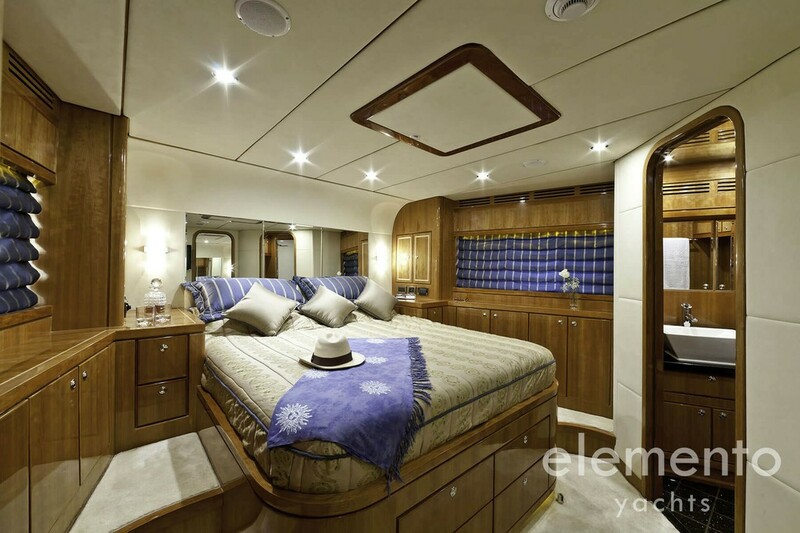 On the foredeck and the flybridge there are comfortable sunbathing areas for relaxing. 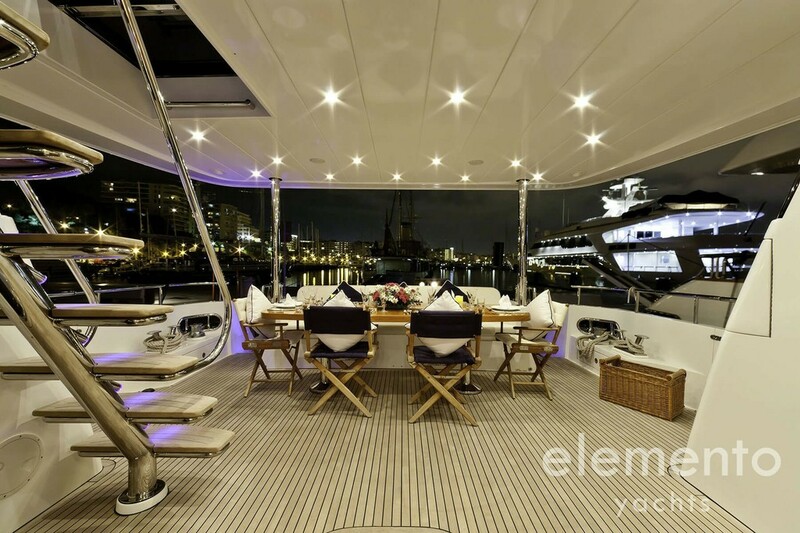 On the aft deck is a large dining table with sofa for nice evenings on board. The bathing platform allows the guest beautiful access to the crystal clear waters of the Mediterranean. Staying aboard will be a pleasure. 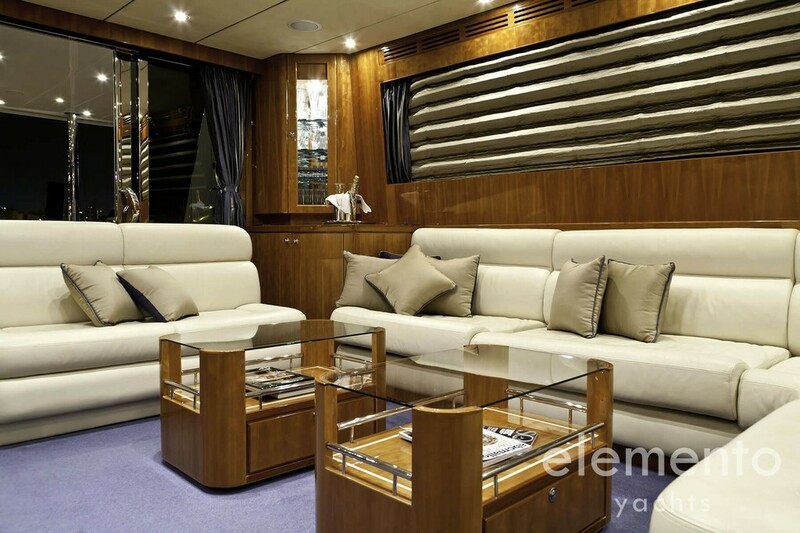 The interior of the “SAMARIC” motor yacht convinces with its beautiful design. Through the large windows plenty of light comes into the interior. In combination with the beautiful colours and materials of the furniture it creates a special well-feeling ambience. All materials used in the interior harmonize very well together. The areas look like in a villa. The salon offers a fully equipped kitchen, large lounge with TV and large dining table for all guests. It also has comfortable sofas. The entertainment system provides entertainment both inside and on deck. 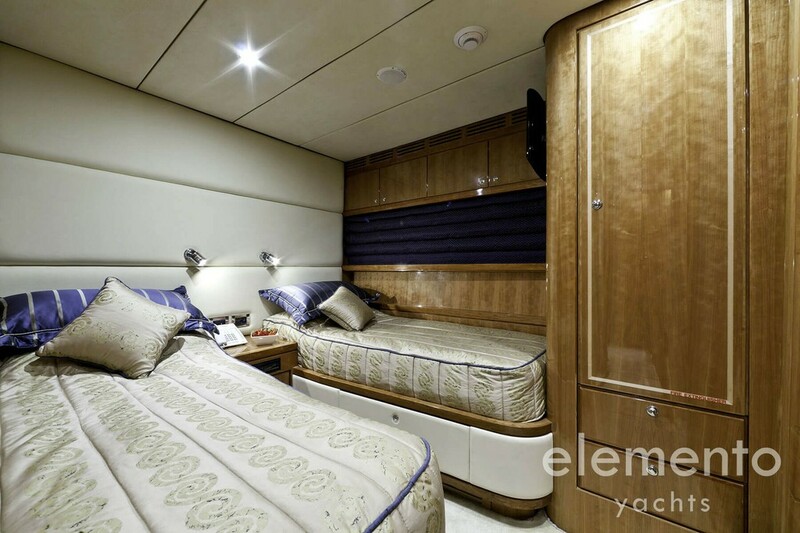 The master, VIP and double cabins are modern, luxurious and the bathrooms leave nothing to be desired. 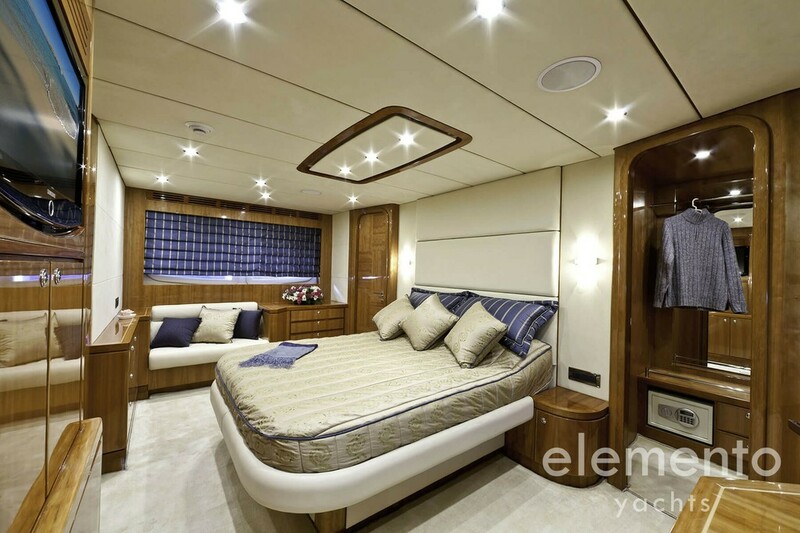 To temper the interior of the yacht offers air conditioning and heating. 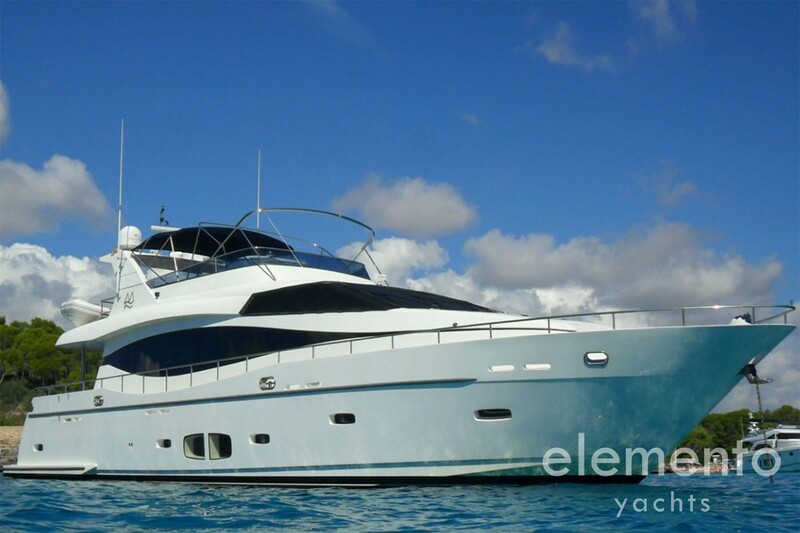 The charter yacht “SAMARIC” is perfect for a great holiday in Majorca, Ibiza or Menorca with family and friends. On board this yacht you will not miss a thing. a. The legal OWNER agrees to let the Vessel to the CHARTERER and not to enter into any other Agreement for the Charter of the Vessel for the same period. The CHARTERER agrees to hire the Vessel and shall pay the Charter Fee, the Advance Provisioning Allowance, the Delivery/Re delivery Fee, the Security Deposit and any other agreed charges, in cleared funds, on or before the dates and to the Account specified in this Agreement. b. The OWNER declares that the Vessel fulfils all the insurance, administrative, maritime and tax regulations and has a valid Charter License to operate within Balearic waters. He further declares that he is recorded as an entrepreneurial before the Spanish Tax Authorities being so far obliged to invoice with Spanish IVA. a.- Reservations will be made on receipt of 50 % of the total rental price. If this payment has not been made in advance, the payment must be made without fail when signing this contract. b.- The remaining amount must be paid 30 days prior to the charter. Failure to pay will result in cancellation of the contract, and the amount already paid as a reservation will be lost and kept by the owner/agency as compensation. c.- Payments can be made by bank transfer, cash or by credit card, VISA or MasterCard only. Payments by credit card will have a 1% service surcharge. The security deposit must be paid latest two days before the charter. The security deposit will be used as a warranty against cancellations, repairs, breakages, damage caused by the charterer, theft, delays in returning the vessel, differences in the inventory and equipment, compensation, improper use, negligence and penalisation of any kind, agreed upon in this contract or which may arise because of fulfilment of said contract. All of which does not affect any legitimate legal action to claim amounts which may exceed that of the deposit. a. The CHARTERER shall pay the Advance Provisioning Allowance (A.P.A.) via the Broker’s Account, as required by this Agreement and shall be advised by the Captain, at intervals, as to the disbursement of the A.P.A. and shall, if the remaining balance becomes insufficient, in the light of current expenditure, pay to the Captain, in cash, a sufficient sum to maintain an adequate credit balance. The OWNER shall ensure the captain will exercise due diligence in the expenditure of the A.P.A. b. Prior to disembarkation at the end of the Charter period, the Captain shall present to the CHARTERER a detailed account of expenditure with as many supporting receipts as possible, and the CHARTERER shall pay to the Captain, in cash, the balance of the expenses, or the Captain shall repay to the CHARTERER in cash, any balance overpaid, as the case may be. c. Payment for special requirements or equipment, shore transport or excursions or any other expenses not customarily considered part of the Vessel’s operating costs may be required to be paid via the Broker’s Account in advance or to the Captain on boarding in addition to the A.P.A. The duration of the charter as foreseen in the specific conditions of this contract may not be varied or altered without prior authorisation from the owner/agency. For each extra hour 15% of the daily charter fee will be charged. a. Up to 12 weeks prior to the date foreseen for the charter start, the charterer may unilaterally waive the contract with no obligation to pay compensation and has the right to the refund of the quantities paid. If the charterer decides to waive the contract less than 12 weeks before departure, the owner/agency will retain 25% of the quantities received from the charterer, less than 8 weeks before departure, the owner/agency will retain 50% of the quantities received from the charterer, less than 4 weeks before departure, the owner/agency will retain 100% of the quantities received from the charterer, in respect of damages caused by said cancellation. b. If prior to the date of cancellation, the Vessel has taken on provisions for the Charter then the CHARTERER shall pay for these expenses unless all or part can either be refunded by the supplier or transferred to the next charter, in which case they shall be adjusted accordingly. The BROKER and OWNER shall be under a duty to mitigate these expenses where possible. c. If, after signature of this Agreement, the OWNER is adjudged bankrupt or, in the case of a company, a liquidator, receiver or Administrator is appointed over all or part of the OWNER’s assets, the CHARTERER shall be entitled to cancel the Charter and all monies paid to the OWNER, his agent, or the Broker pursuant to this Agreement shall be refunded without deduction. d. If the charterer would like to terminate this agreement due to severe weather, the owner will not be liable to compensate or refund any part of the charter period or money. a. The owner shall at the beginning of the Charter deliver the Vessel to the Port of Delivery and the CHARTERER shall take delivery in full commission and working order, seaworthy, clean, in good condition throughout and ready for service, with full equipment, including up to date safety and life-saving equipment (including life-jackets for children if any are carried in the Charterer’s Party) as required by the Vessel’s registration authority and fitted out as appropriate for a Vessel of her size and type and enabling the CHARTERER to Use of the Vessel as set out in Clause (12). The owner does not warrant her comfort in bad weather conditions for all cruises or passages within the Charter Area. a. The Charterer shall re-deliver the Vessel to the owner at the Port of Re-Delivery free of any debts incurred for the CHARTERER’s accounts during the Charter Period and in as good a condition as when delivery was taken, except for fair wear and tear arising from ordinary use. The CHARTERER may, if he wishes, re-deliver the Vessel to the Port of Re-Delivery and disembark prior to the end of the Charter Period but such early re-delivery shall not entitle the CHARTERER to any refund of the CHARTER Fee. a. The CHARTERER shall restrict the cruising of the Vessel to within the Cruising Area and to within regions in the Cruising Area in which the Vessel is legally permitted to cruise, within Balearic territorial waters. The CHARTERER shall also restrict time under way to an average of six (6) hours per day, unless the designated skipper, at his sole discretion, agrees to exceed this time. a. The CHARTERER shall not at any time during the Charter Period permit more than the Maximum Number of Guests Sleeping or Cruising on Board plus, at the sole discretion of the Designated Skipper a reasonable number of visitors whilst the Vessel is securely moored in port. b. If children are taken on board, the Charterer shall be fully responsible for their, conduct and entertainment and shall be held responsible for their conduct or entertainment. c. The nature of a charter may render it unsuitable for anybody with physical disability or undergoing medical treatment. By signature of this Agreement, the CHARTERER warrants the medical fitness of all members of the CHARTERER’S party for the voyage contemplated by this agreement. The CHARTERER and his party undertake to have all necessary visas and vaccinations for the countries to be visited. a. The CHARTERER shall be responsible for the operating costs, as specifically defined under “CONDITIONS” on the Charter Particulars referred in Page 1 of this agreement for the entire Charter Period for himself and his Guests. b. Unless specific alternative arrangements have been made in writing, in advance, all payments for operating costs etc., shall be payable in cash in the same currency as the Charter Fee. Payment by cheque, Credit Card, or other negotiable instrument is not normally acceptable due to the itinerant nature of the Vessel and the CHARTERER shall therefore ensure that he has sufficient funds available to cover all reasonably foreseeable expenses or arrange to deposit additional funds with the Broker. a. If, by reason of FORCE MAJEURE (as defined the Clause 18.1. ), the OWNER fails to deliver the Vessel to the CHARTERER at the port of delivery at the commencement of the Charter Period and delivery is made within forty-eight (48) hours of the scheduled commencement date, or within one tenth (1/10th) of the Charter period, whichever period is the shorter, the OWNER shall pay to the CHARTERER a refund of the Charter Fee at a pro rata daily rate or if it be mutually agreed the OWNER shall allow a pro rata extension of the Charter period. If by reason of FORCE MAJEURE the OWNER fails to deliver the Vessel within forty-eight (48) hours or a period equivalent to one-tenth (1/10th) of the Charter Period, whichever period is the shorter, from the due time of delivery, the CHARTERER shall be entitled to treat this Agreement as terminated. The CHARTERER’s exclusive remedy will be to receive repayment without interest of the full amount of payments made by him to the OWNER or Broker. Alternatively, if the parties mutually agree, the Charter Period shall be extended by a time equivalent to the delay. d. More than fourteen (14) days but less than thirty (30) days before commencement of the Charter Period, an amount equivalent to five percent (5%) of the Charter Fee. e. Fourteen (14) days or less before commencement of the Charter Period, an amount equivalent to ten percent (10%) of the Charter fee. a. If re-delivery of the Vessel is delayed by reason of FORCE MAJEURE re-delivery shall be done as soon as possible thereafter and in the meantime the conditions of this Agreement shall remain in force but without penalty or additional charge against the CHARTERER. b. If the CHARTERER fails to re-deliver the Vessel to the owner at the Port of Re-Delivery due to intentional delay or change of itinerary against the Brokers or Designated Skippers advice then the CHARTERER shall pay forthwith to the owner by credit card charge via the Broker’s Account at the daily rate plus forty per cent (40%) of the daily rate and if delay in re delivery exceeds twenty-four (24) hours, the CHARTERER shall be liable to indemnify the owner for any loss or damage which the owner shall suffer by reason of deprivation of the use of the Vessel or cancellation or of delay in delivery under any subsequent Charter of the vessel. a. If after delivery the Vessel shall at any time be disabled by breakdown of machinery, grounding, collision or other cause so as to prevent reasonable use of the Vessel by the CHARTERER for a period between twelve (12) and forty-eight (48) consecutive hours or one tenth of the Charter Period, whichever is the shorter and the disablement has not been brought about by any act or default of the CHARTERER, depending of the category of the systems or equipment failed, the OWNER shall make a pro rata refund of the Charter Fee for the period of the disablement or, if mutually agreed, allow a pro rata extension of the Charter Period corresponding with the period of disablement. Cat A >>> All the problems in this group will be compensated FULL PRO-RATA. Cat B >>> All the problems in this group will be compensated HALF PRO-RATA. Cat C >>> There will be NO compensation pro-rata for this group. b. If the CHARTERER wishes to invoke this clause he shall give immediate notice in writing to the Broker or Owner. The CHARTERER shall remain liable for normal expenses during the period of disablement. c. In the event of the actual or constructive total loss of the Vessel or if the Vessel is disabled as aforesaid for a consecutive period of more than forty-eight (48) hours or one tenth of the Charter Period, whichever is shorter, the CHARTERER may terminate this Agreement by notice in writing to the OWNER or the Broker(s) if no means of communication is available. As soon as practicable after such termination the Charter Fee shall be repaid by the OWNER pro rata without interest for that proportion of the Charter Period outstanding after the date and time on which the loss or disablement occurred. In the event of such termination the CHARTERER may affect redelivery by giving up possession of the Vessel where she lies. The CHARTERER shall be entitled to recover from the OWNER the reasonable cost of returning the charter party to the port of re-delivery by scheduled services together with reasonable Accommodation expenses incurred. Alternatively, after a consecutive period of disablement of more than forty-eight (48) hours or one tenth of the Charter Period, whichever the shorter, and dependent on the nature and seriousness of the disablement, by agreement the Charterer may elect to remain on board for the duration of the Charter Period and the CHARTERER will then have no further or additional claim against the OWNER. a. Upon accepting this boat, the CHARTERER agrees that, except where noted in the check-in form, the yacht and its furnishings and equipment is undamaged and in proper working order to CHARTERER’s satisfaction. The CHARTERER shall be offered the opportunity to inspect the yacht including the yachts inventory, hull, deck, canvas, propulsion system including propellers, shafts, rudders, struts, underwater hull, electronics and all equipment unless noted upon the pre-departure inspection meets to CHARTERER´S satisfaction. b. Any incidental breakdowns to yacht equipment other than to the Category A or Category B systems shall not be cause for discount or pro-ration of the yacht fee. a. The CHARTERER and/or his DESIGNATED SKIPPER shall comply, and shall ensure that the Guests comply, with the laws and regulations of customs applicable to the Balearic waters, or harbour and other authorities. b. He will not allow the yacht to be used for unlawful purposes. When unattended the CHARTERER or the by him DESIGNATED SKIPPER is to ensure that the companionway hatch and all lockers are securely locked and that loose valuable items (e.g. the outboard motor) are properly locked or stowed in locked compartments to discourage theft. c. The CHARTERER shall ensure that no pets or other animals are brought on board the Vessel without the consent in writing of the OWNER. The CHARTERER shall ensure that the behaviour of the charter party shall not cause a nuisance to any person or bring the Vessel into disrepute. The CHARTERER and guests shall afford the crew (if any) due respect at all times. d. If the CHARTERER or any of the Guests shall commit any offence contrary to the laws and regulations which results in any member of the crew of the Vessel being detained, fined or imprisoned, or the Vessel being detained, arrested, seized or fined, the CHARTERER shall indemnify the OWNER against all loss, damage and expense incurred by the OWNER as a result, and the OWNER may, by notice to the CHARTERER, terminate this Agreement forthwith. e. It is also specifically understood that the possession or use of any illegal drugs or any weapons (including particularly firearms) is strictly prohibited on board the Vessel and failure to comply shall be sufficient reason for the OWNER to terminate the Charter forthwith without refund or recourse against the OWNER. SMOKING IS EXPRESSIVELY FORBIDDEN IN ANY INTERIOR SPACE ON BOARD THE VESSEL. a. The CHARTERER shall give notice of any complaint in the first instance to the broker and note shall be taken of the time, date and nature of the complaint. If, however, this complaint cannot be resolved on board the Vessel then the CHARTERER shall give notice to the owner or to the Broker on behalf of the owner as soon as practicable aft the event giving rise to the complaint has taken place and any way within twenty four hours of the event or occurrence unless it is impracticable due to failure or no availability of communications equipment. The complaint may be made verbally in the first instance but shall be confirmed as soon as possible in writing (by fax, telex or mail) specifying the precise nature of the complaint. a. The CHARTERER shall not assign this Agreement, lend, sub-let the Vessel or part with control of the Vessel without the consent in writing of the owner, which consent may be on such terms as the owner thinks fit. a. The OWNER agrees not to sell the Vessel during the Charter Period as set out on Page One of this Agreement. c. The OWNER shall arrange for the Buyer to perform the Charter on the same terms and conditions by assignment of this Yacht Charter Agreement. Where the Charter is taken over by the Buyer on the same terms and conditions there shall be no penalty against the OWNER and no additional commission due to the Broker. d. If the Buyer is unwilling or unable to fulfil the Charter Agreement, the OWNER hereby appoints the Broker to procure the Charter of a replacement Vessel of similar or superior standard and condition for the Charter Period. If a suitable replacement Vessel is found a new Charter Agreement shall be prepared and this original Agreement cancelled. The OWNER shall pay the Broker’s commission on the original Charter and the Broker may retain any commission due on the replacement Vessel. e. Should the OWNER be unable to obtain a similar or superior Vessel for the use of the CHARTERER on the same terms as this original Agreement or should the CHARTERER reject the proposed replacement (the CHARTERER shall not unreasonably reject a substitute Vessel of same or superior standard) then this Charter Agreement shall be considered as having been cancelled by the OWNER in accordance with Clause 7. All payments made by the Charterer shall be promptly repaid in full to him without deduction, and in addition liquidated damages calculated in accordance with Clause 7 as appropriate shall be paid. The Broker shall be paid by the OWNER the full commission due on this original Agreement. a. The OWNER shall insure the Vessel and her equipment against fire, marine collision, risks with third party claim and passenger’s accident cover of not less than first-class insurers against all customary risks for a Vessel of her size and type is provided under Institute Yacht Clauses 1.11.85 or other recognised terms extended to provide Permission to Charter and to cover Third Party and Pax. Accidents liability, Water Skiers liabilities together with liabilities arising from the use by the CHARTERER and other competent person(s) authorized by him of personal water craft and other similar powered craft as well as windsurfers, dinghies, catamarans or another water-sports equipment carried by the Vessel. The CHARTERER shall be entitled to the benefit of the OWNER’s insurances. b. The OWNER, or his representative, is further obliged to provide Certificates of Third Parties and Pax Accidents insurance as per Real Decreto 607/1999, de 16 de abril, and OM del Consejero de Movilidad y Ordenación del Territorio de 25 de octubre de 2007 (obligatory for the application of the Charter License. c. All such insurances shall be on such terms and subject to such excess (deductible) as are customary for a Vessel of this size and type. Copies of all relevant insurance documentation shall be available for inspection by the CHARTERER prior to the Charter on reasonable notice to the OWNER, and shall be carried on board the Vessel. d. Notwithstanding the foresaid, the CHARTERER shall indemnify the OWNER in respect of any loss or damage to the yacht or her equipment or any other equipment or liability arising out of negligent or deliberate act or omission of the CHARTERER, his designated skipper and/or crew, his servants or agents or any member of his party or any other person invited by him onto the yacht. However, under normal circumstances the CHARTERER shall only be liable for such costs or losses as may be incurred repairing damage caused by the CHARTERER or his guests up to the level of the Excess (Deductible) on the OWNER’s insurance policy for each separate accident or occurrence. However, in any event, the CHARTERER’s liability shall not exceed an excess (deductible) the equivalent of ten percent (10%) of the total sum insured. f. The CHARTERER shall carry independent insurance for Personal Effects whilst on board or ashore and for any Medical or Accident expenses incurred other than as covered under the Vessel’s insurance. The CHARTERER should be aware that neither Cancellation and Curtailment Insurance, nor CHARTERER’s Liability Insurance is included in this Agreement but is available subject to acceptance by underwriters. a. In this Agreement “Force Majeure” means any causes directly attributable to axe, events, non-happenings, omissions, accidents or acts of nature beyond the reasonable control of OWNER or the CHARTERER (including, but not limited to, strikes, lockouts or other labour disputes, civil commotion, riots, blockades, invasion, war, fire, explosion, sabotage, storm, fog, Governmental Act or Regulations, major mechanical or electrical breakdown beyond the crew’s control and not causes by the negligence of CHARTERER, Crew changes do not constitute force majeure does not excuse the owner from payment of commissions. b. Throughout the Agreement, the terms “OWNER”, “CHARTERER”, and “BROKER” and corresponding pronouns shall be construed to apply whether OWNER, CHARTERER or BROKER is male, female or corporate, singular or plural, as the case may be. a. During the period of the Charter the benefits, if any, from all derelicts, salvages and towages, after paying the crew’s proportion, hire for the relevant period and expenses, shall be shared equally between The Owner and the CHARTERER. b. The Brokers’ commission shall be deemed to be earned by the Broker(s) upon the signing of this Agreement and be payable by the OWNER on the full Charter Fee plus the Delivery/Redelivery Fee, if applicable, but excluding running expenses, according to Clause 21 below, whether he defaults for any reason including force majeure. In the event of Cancellation by the CHARTERER. The commission shall be deducted as an expense from the deposit. c. If the CHARTERER should extend this Charter, the Brokers shall be entitled to and shall be paid by the OWNER, commission on the gross Charter Fee for the extension, on the same basis as provided herein. d. If the CHARTERER should re-charter the Vessel from the OWNER, his Agent or the Stakeholder, within two (2) years from the date of completion of this Charter, whether or not on the same terms, then the Brokers shall be entitled to, and shall be paid by the OWNER, commission on the gross Charter Fee paid for that further charter upon the same basis as provided herein. However, if the CHARTERER should choose to re-charter the Vessel within this two-year period via another bona fide Broker, to whom the commission is being paid, the OWNER shall pay a commission of one-third (1/3rd) of the full rate to the original Broker and two thirds (2/3rds) to the new Broker. This only applies following the free choice of the CHARTERER and is not relevant if the change of broker is suggested or solicited by the OWNER, his agent, or representative. e. The Brokers in this Agreement shall have no responsibility for any loss, damage or injury to the person or property of the OWNER or CHARTERER or any of their Guests, servants or agents, and further the Brokers shall be under no liability for any errors of judgement or description or otherwise of whatsoever nature and howsoever arising and shall be under no further obligation, duty or responsibility to the OWNER or the CHARTERER save as set out herein. The OWNER and the CHARTERER shall jointly and severally indemnify and hold harmless the Brokers for any loss or damage sustained by them because of any liability by the Brokers to any Third Party (person, firm, company or authority) arising from promoting or introducing this Charter, assisting in the performance of this Agreement or performing the duty of Stakeholder. f. For the purposes of this Clause, the terms OWNER and CHARTERER shall be understood to mean the named company or individual, or any company owned or controlled by them including companies owned indirectly or via Trustees, any Director of such a company, Beneficial Owner, Nominee, Agent or charterer’s Guest. a. All funds to be received by the Broker against this Agreement shall be kept in a designated Clients Account in the currency of this Agreement. The owner or the broker will issue an invoice for the charterer with his details showing full charter fee. The charterer will transfer all funds in to brokers Clients Account (mentioned in the Charter Particulars referred in Page 2). a. Unless otherwise agreed herein, all the notices, notifications, consents and other communications required or permitted here under shall be made in writing and shall be properly made by the parties if they are remitted and delivered by registered mail to the addresses or by SMS to the Brokers. In the case of posting any such notice shall be deemed duly served at the expiration of seven (7) Business Days after the time of posting and in the case of facsimile transmission, on the Business Day immediately following the date of transmission. b. Notice given or required to be given by either party to this Agreement shall be communicated in any form of writing or shall be deemed to have been properly given. a. The earliest check-in time is 10:00. Check in process might take hours it all depends on the understanding of the DS and experience. This process has no time limit nor will be cut short. b. Latest time for checkout is 18:00 or sunset (whichever comes first). By this time the vessel must have been returned to her designated mooring, fully fuelled and moored safely. The charterer needs to allow sufficient time (at least 30 minutes) for owner’s representative to complete the checkout procedure. c. In Spain the most fuel stations close at 18:00h. During busy periods of the year waiting time for refuelling can be up to one hour so at these times the charterer should arrive at the fuel station 1 to 1½ hours before the required check-out time. Fuel cost is to be paid by the client from the home port of the vessel, not from the point of pick up. d. In case of being unable to refuel, for whatever reason, the fuel cost will be deducted from the security deposit if the fuel has been paid from the captain/owner of the boat. In case the Broker has to pay for the fuel an additional 21% will be charged and paid from the security deposit. 1. The charterer must complete checkout procedure at least 3 hours prior to their flight time departure. 2. The charterer shall not incur further charges providing the checkout procedure is not later than the contracted time. If the contracted time is exceeded, then a surcharge of 15% of the daily charter fee will be payable in order to recompense staff for unplanned evening overtime. 3. The full fuel tank fee in cash (min.1000€) must be paid before the charterer leaves the charter vessel. a. This Agreement and all amendments, modifications, alterations or supplements hereto, the right of the parties hereunder, and the validity and effect of this Agreement shall be governed by and construed and enforced in accordance with the Laws of Spain. Specifically, by the Order of the Ministry of Transport, Tourism and Communications, December 4, 1985, number 1542 and following articles of the Civil Code, the Resolution number 2389 of January 26, 1998 and the General Law for the protection of consumers and users, dated July 19, 1984 and any other rules governing pleasure craft or maritime navigation. b. In any controversy or claim between the parties arises under or relating to this Agreement, only courts in Mallorca, Spain, shall have jurisdiction to hear and decide such matter. Each of the parties hereby irrevocably consent to the jurisdiction and venue of the referred courts in any action arising under or relating to this Agreement and waives any and all jurisdictional defences such party may have to the institution of any such action in any court. c. In witness whereof, both parties are signing this present document in duplicate ant to one only effect, on the date and place written above. d. Both parties grant full validity to the signature of the other party given by Fax. The following stipulations would be only applicable in case of crew charter (not bareboat). a. The OWNER shall appoint and employ a suitably experienced person to be skipper of the yacht. Thereinafter the CAPTAIN and a professional crew, prior to the charter, that fulfil all the Spanish legal, tax and labour (recording in the Marine Social Security) requirements for such vessel and navigation according to Real Decreto 2062/1999, de 20 de December, if the vessel has Spanish Ship´s Registration. c. The OWNER warrants that the CAPTAIN and Crew have the qualification, experience and competence as formally stated in the booking form and that they are capable of the safe handling of the yacht. d. The OWNER under his sole responsibility also will be obliged to pay the salaries, social security and withholding taxes of CAPTAIN and crew. a. Captain, must have at least professional qualification of a Spanish PATRON DE CABOTAJE or any other homologated foreign license. b. Crew: stewardess, sailor and engine officers, shall be as requested by the State of Registration. a. The captain shall take care of and assume full responsibility for the safety and maintenance of the yacht and its equipment at all times, including periods when the yacht is left unattended. When unattended the skipper is to ensure that the companionway hatch and all lockers are securely locked and that loose valuable items (e.g. the outboard motor) are properly locked or stowed in locked compartments to discourage theft. b. The owner shall ensure that the Captain shows the CHARTERER the same attention as if the CHARTERER were the owner and the Captain shall comply with all reasonable orders given to him by the CHARTERER regarding the management, operation and movement of the Vessel, wind weather and other circumstances permitting. The Captain shall not however, be bound to comply with any order which, in the reasonable opinion of the Captain, might result in the Vessel moving to any port or place that is not safe and proper for her to be in, or might result in the CHARTERER failing to re-deliver the Vessel upon the expiration of the Charter Period, or would, in the reasonable opinion of the Captain cause a breach of Clause (8) and/or any other clause of this agreement. c. Further, without prejudice to any other remedy of the owner, if in the reasonable opinion of the Captain the CHARTERER or any of his guests fail to observe any of the provisions in Clause (12) and if such failure continues after the Captain has given due and specific warning to the CHARTERER in writing in respect of the same, the Captain shall inform the owner and the Broker(s) and the owner may terminate the Charter forthwith or instruct the Captain to return the Vessel to the Port of Re-Delivery and upon such return the Charter Period shall be terminated. The CHARTERER and his guests shall disembark, the CHARTERER having settled all outstanding expenses with the Captain beforehand and the CHARTERER shall not be entitled to be refunded any of the Charter Fee. d. With particular regard to the use of water sports equipment as defined in Clause (12) the Captain shall have the authority to exclude the CHARTERER or any or all of his guests from use of any particular water sports equipment if, in his reasonable opinion, they are not competent, are unsafe, are behaving in an irresponsible manner or are failing to show due concern for other persons when operating this equipment. a. The OWNER shall ensure that no member of the Crew shall carry or use any illegal drugs on board the Vessel or keep any fire arms on board (other than those declared on the manifest) and shall ensure that the Captain and Crew comply with the laws and regulations of any Country into whose waters the Vessel shall enter during this agreement. a. Complaints regarding captain (if any) or standards of the crew (if any) will have to take direct route to owner or broker immediately for owner to hear and take an action to end the dispute. If dispute cannot be resolved the charterer needs to take the issue to law. a. Except where the context otherwise requires, references in this ADDITION to CAPTAIN and Crew will be applicable to the terms of this Agreement referred to the DESIGNATED SKIPPER. b. All the Clauses referred to the DESIGNATED SKIPPER, especially clause 24, will be applicable to the CAPTAIN if they do not contravene clauses 27 to 33.